These amazing animals aren’t actually crabs, but are more closely related to arachnids. They can grow up to 60 cm long including their tail. The females are usually larger than the males. 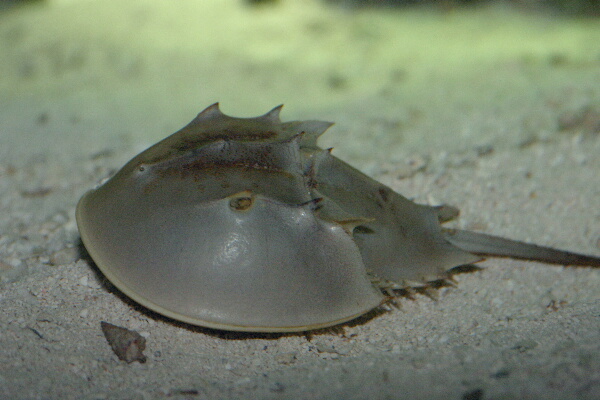 Atlantic horseshoe crabs have nine eyes. Two eyes are on the side of their head, five are on top of their shell and two are underneath. Their tail also has the ability to detect light. They have blue blood and have the ability to regrow their limbs if they need to. At breeding time, males arrive at the breeding site first and then, when they find a female, they hold on to them with a special limb that enables them to hold on for months at a time. The females come to the beach to lay their eggs. The larger the female, the more eggs they lay, with the biggest laying up to 64,000 eggs at a time. Atlantic horseshoe crabs live in the Gulf of Mexico and along the northern Atlantic coast of North America. They have been harvested in their millions over the years and may be threatened if they aren’t protected. Protecting these amazing creatures would also help to save species that eat their eggs. Are there any other interesting facts that you would like to share about Atlantic horseshoe crabs?